These fellows imagined and designed SunCommon. Duane and James have been working side-by-side since 2011, and compliment each other’s strengths and weaknesses well to make an effective and fun team. James manages all things solar at SunCommon — including design, sales, procurement and installation. Having dedicated his professional career to helping create a clean energy future, James has deep experience in energy policy, clean energy technology and government relations. He worked in Washington State, Connecticut, Florida, New Jersey, Washington DC, New Hampshire and New Mexico before moving to Vermont in 2004. 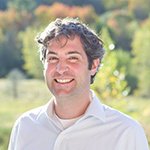 James directed VPIRG’s Clean Energy Program and co-directed, with Duane, the successful VPIRG Energy project. Family and food are two of James’ favorite pastimes and he loves to disappear into the woods on his tele skis or head out for a hike or bike ride. James lives in Montpelier with his amazing wife Mia and their two young sons, William and Oliver. Read more about James on our Blog!